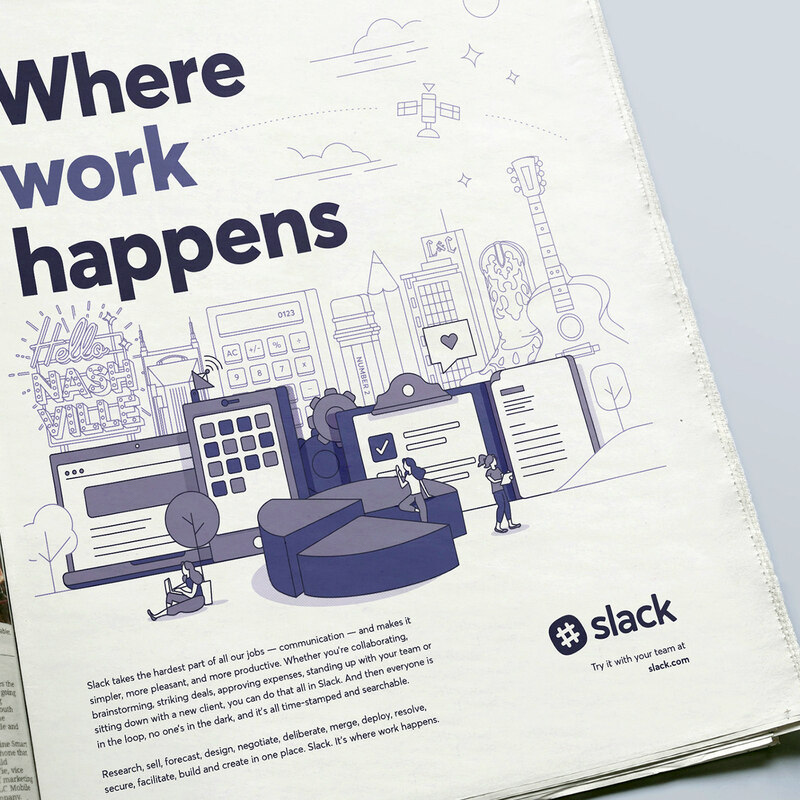 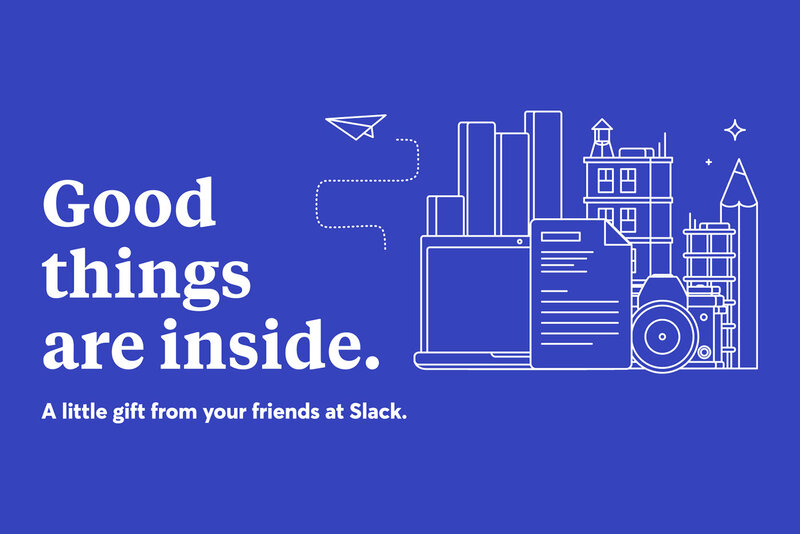 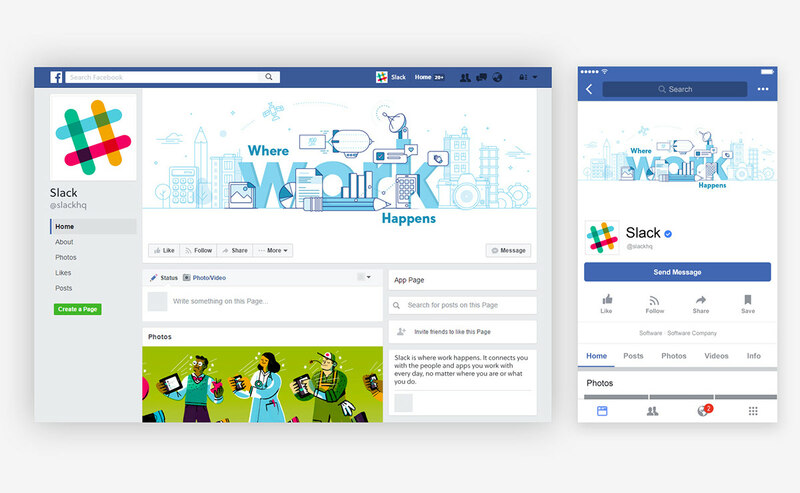 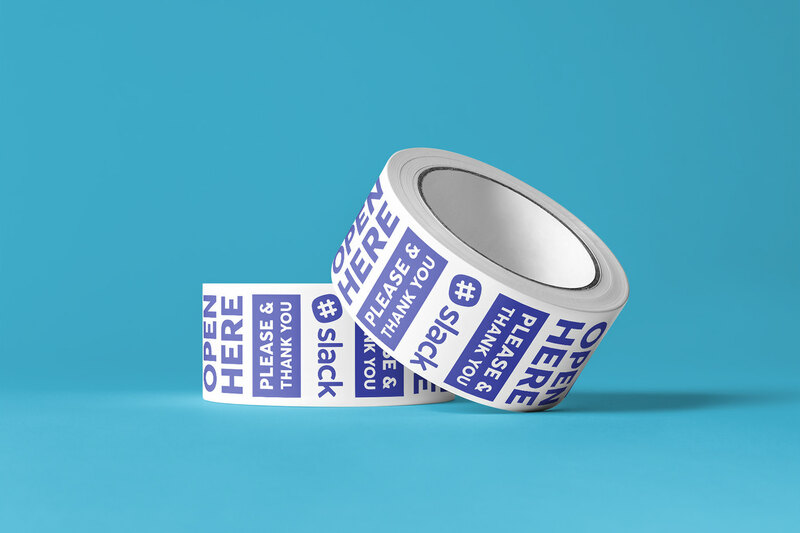 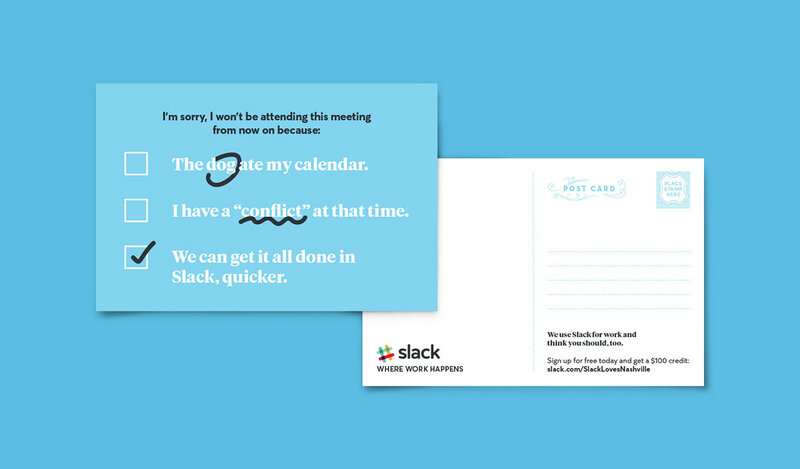 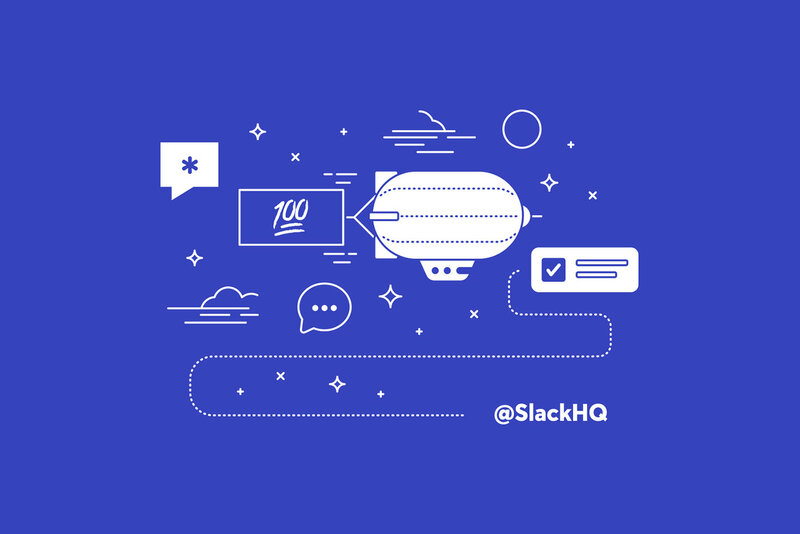 Slack launched an integrated marketing campaign for the second half of 2017 to bring it's "Where Work Happens" message to national and international audiences. 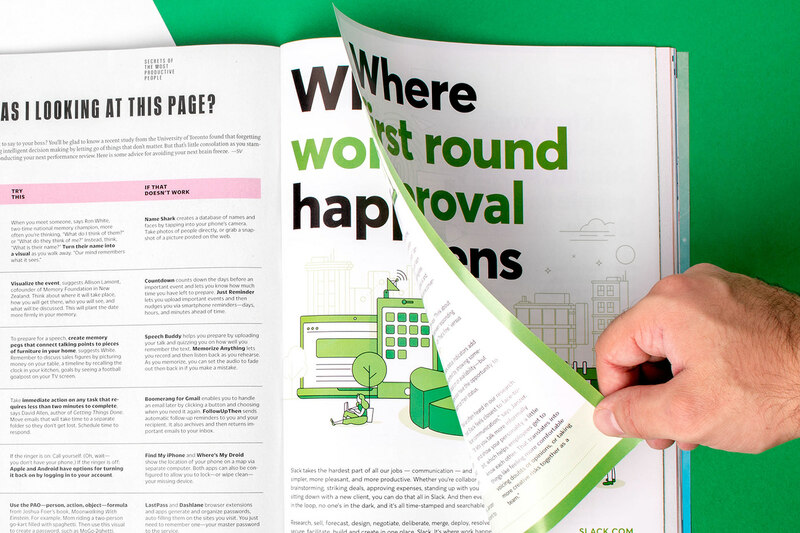 We also targeted hyper-local audiences through city-specific advertising, as well as career vertical-specific ads with custom artwork and copywriting focused on engineering, creative, sales, and entrepreneurial roles. 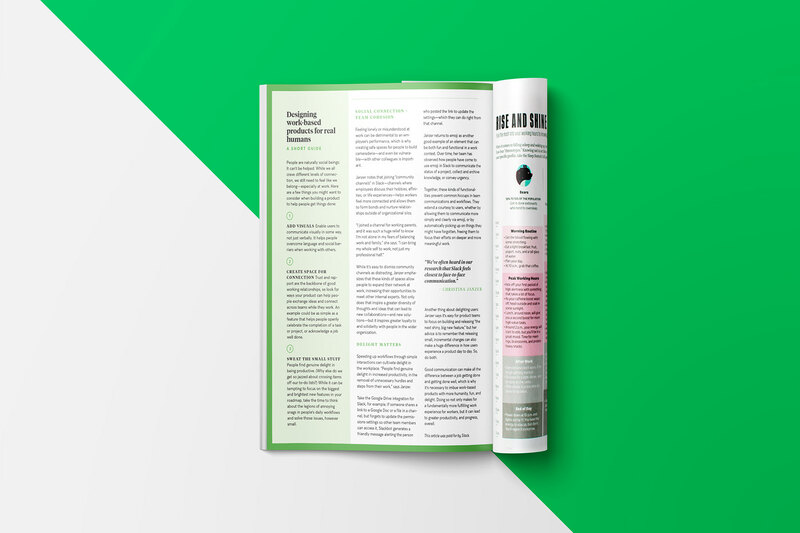 The goal of the overall campaign was to drive top-line awareness with advertorials, podcasts, print ads and Out Of Home advertising. 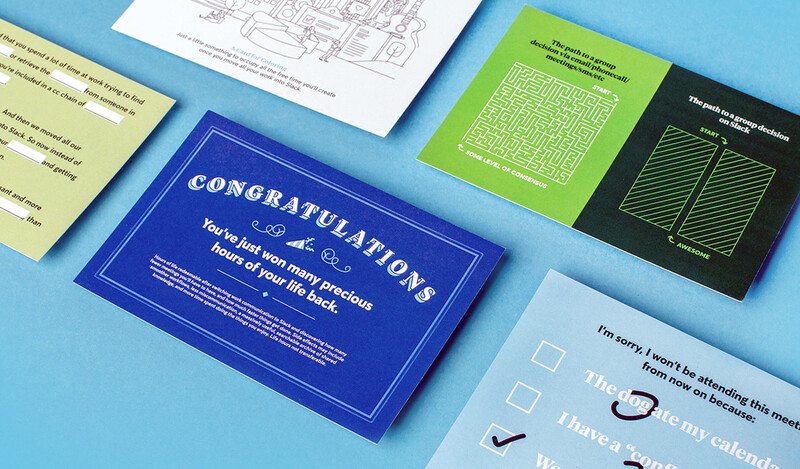 My role was to design all of the creative for the campaign, making it cohesive yet unique for each market. 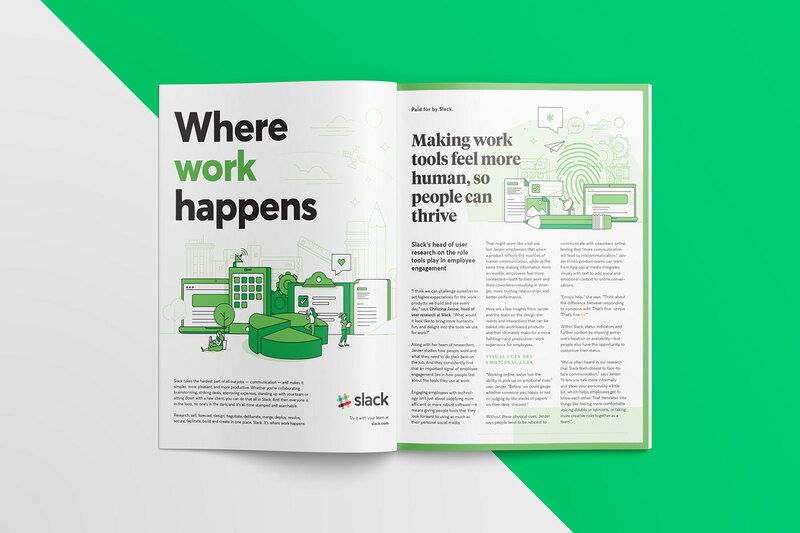 My approach for the creative was to illustrate scenes where work, as a concept, was a destination itself – larger than life, a world where all of these collaborative interactions can take place within. 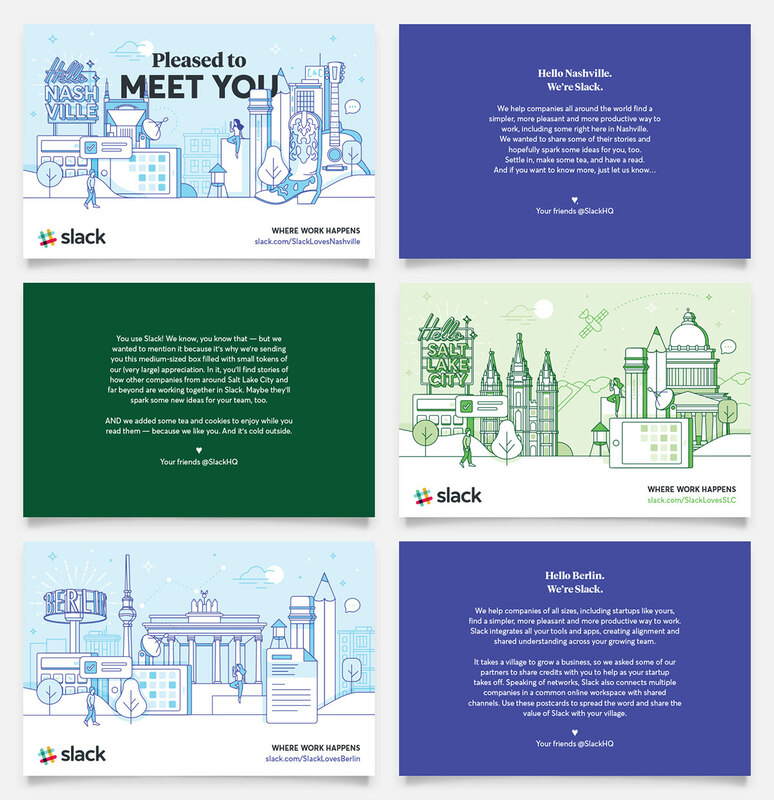 I built an illustration library where each of these individual pieces could be pulled and placed together to create new scenes. 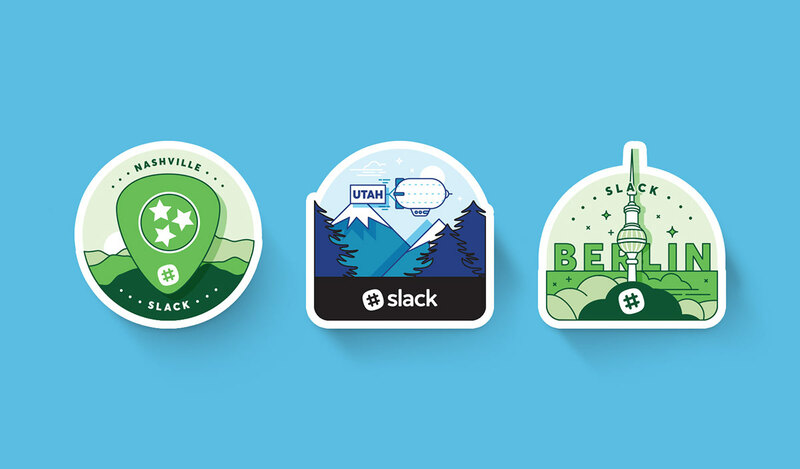 The library featured artwork that could be general for national ads, or become specific to the cities that they would appear in (a giant guitar as part of the Nashville skyline, or ski slopes for Salt Lake City) as well as artwork that would be specific to the specific industries we were targeting (swatch books for creative, and quarterly reports for sales teams, for example). 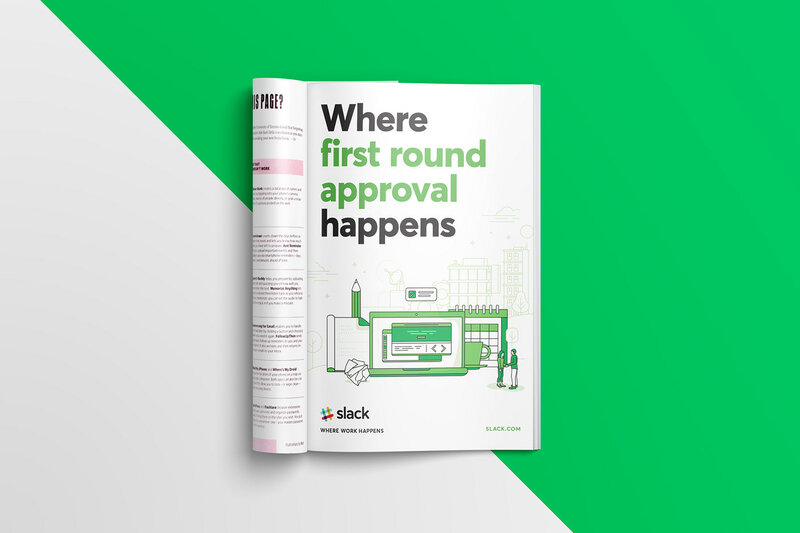 This was an extremely collaborative project with the stakeholders in marketing as well as our production agencies who helped make all of the placements and applications happen! 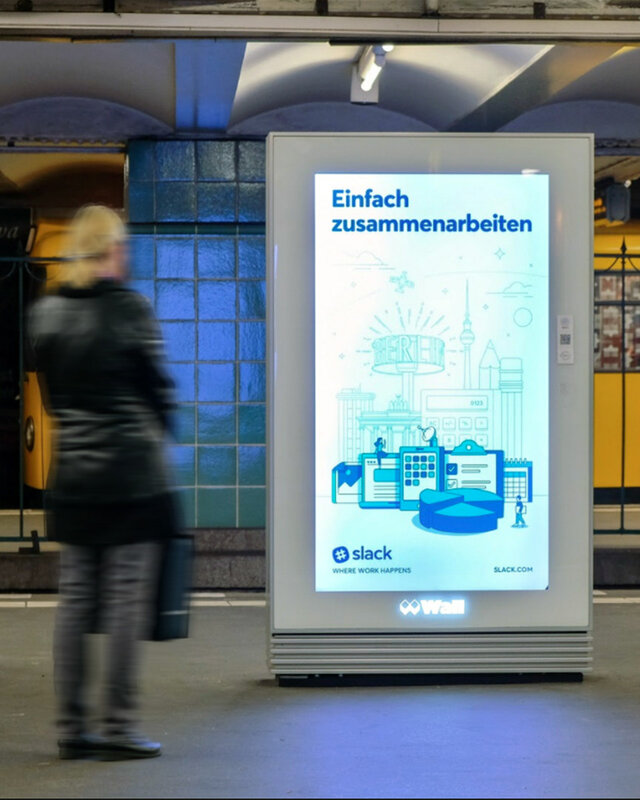 The city-specific advertising focused on Nashville, Salt Lake City, and Berlin as test markets for the campaign. 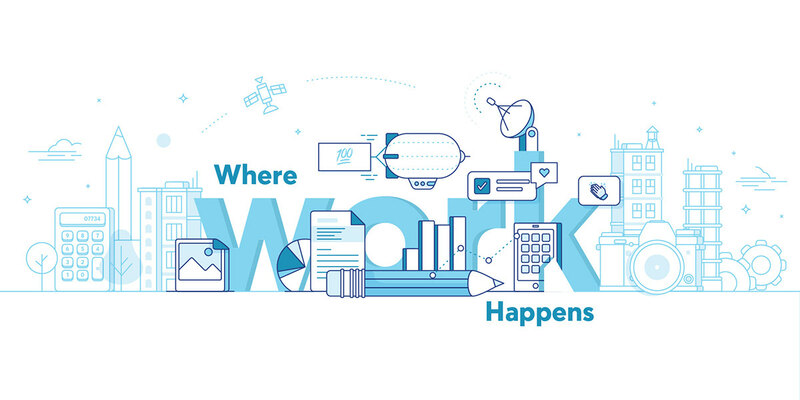 We ran a mixture of Out Of Home media in each market featuring both “Where Work Happens” ads as well as “Where ____ Happens” ads customized to each market. 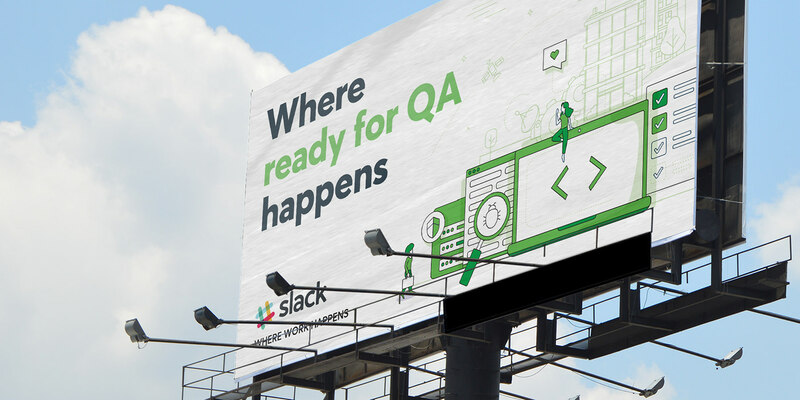 In Nashville: billboards, wallscapes, bus shelters, and exterior bus ads. 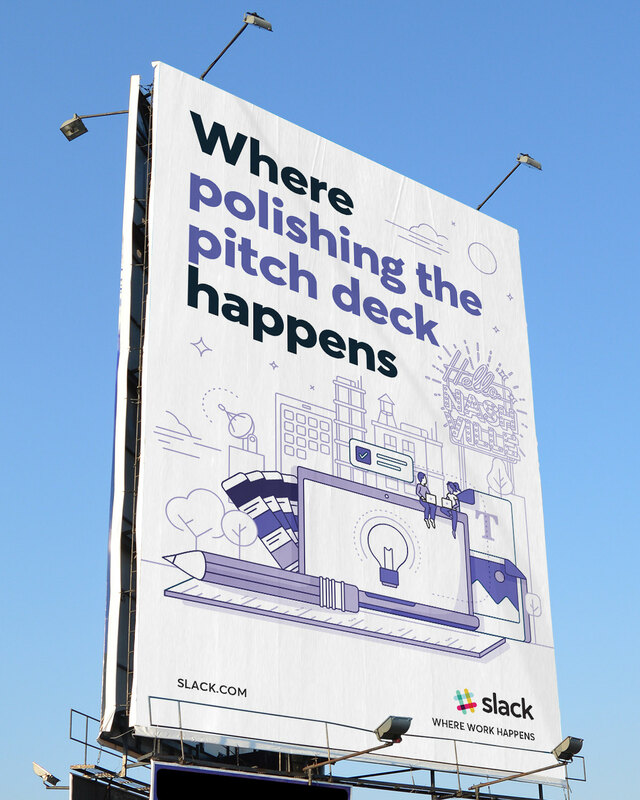 In SLC: billboards, exterior bus ads, and exterior light rail ads. 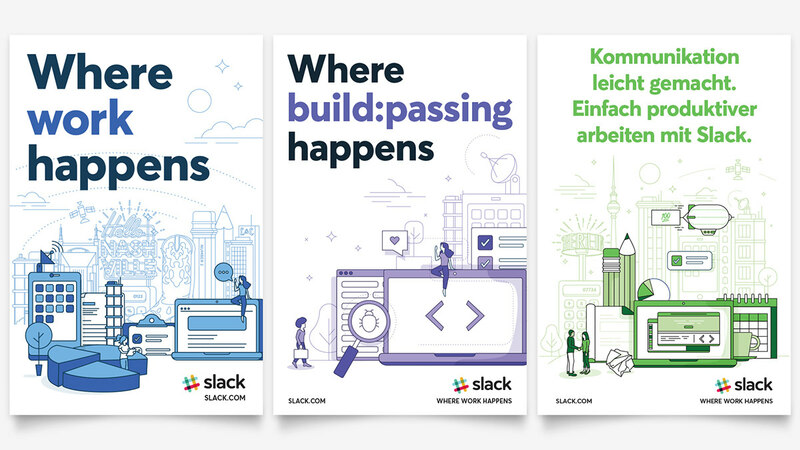 And in Berlin: columns, posters, and metro stations. 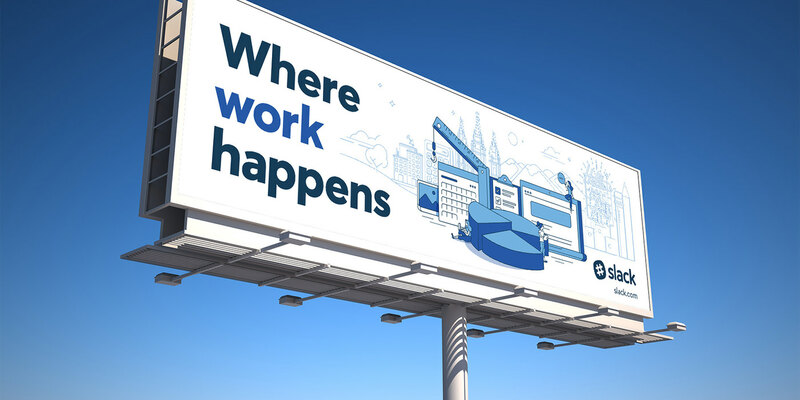 This drove an estimated 76M OOH impressions in Nashville; an estimated 64M OOH impressions in SLC; and an estimated 128M OOH impressions in Berlin. 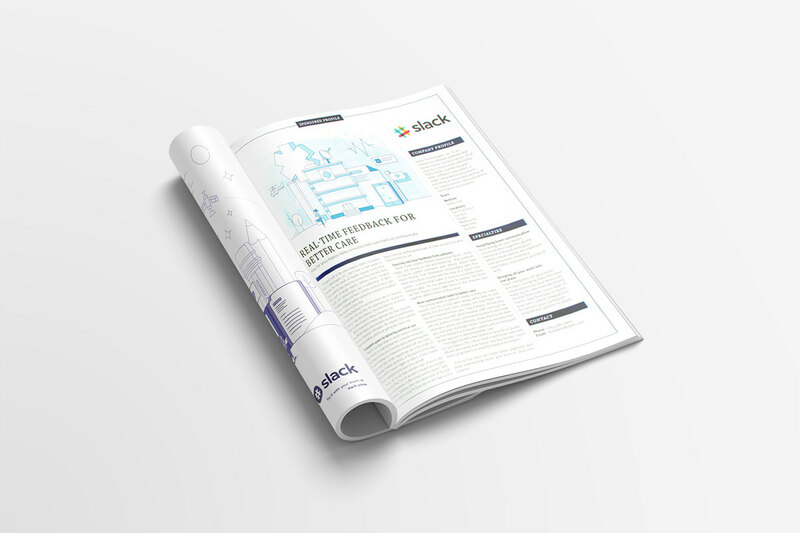 The result was a boost in unaided awareness of ↑23% for SLC, ↑19% for Nashville, and ↑63% for Berlin, and a boost in searches of ↑1% for SLC, ↑3% for Nashville, and ↑4% for Berlin. 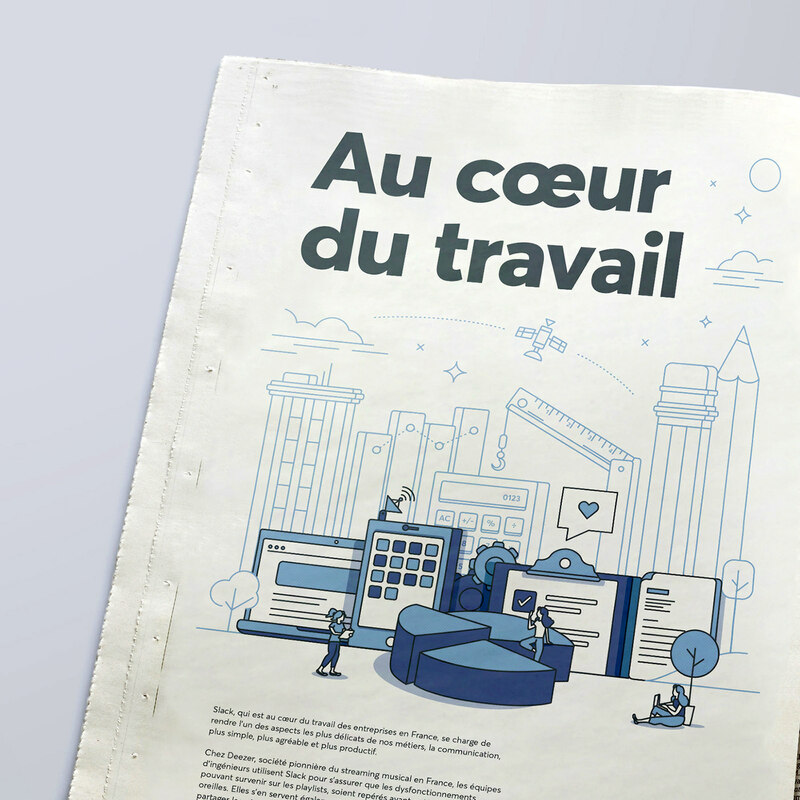 National print advertising (shown above) as well as city-specific, full-page ads in local business and news periodicals (shown below: Nashville newspaper advertisement, as well as one of the French newspaper advertisements). 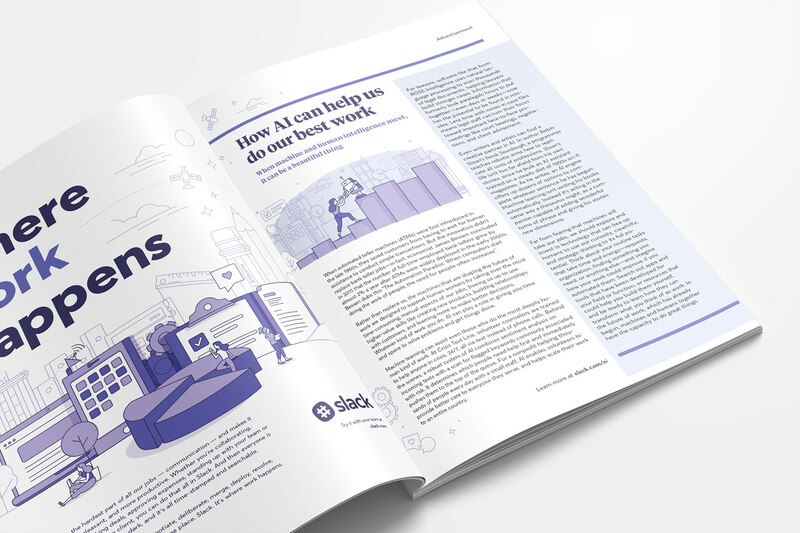 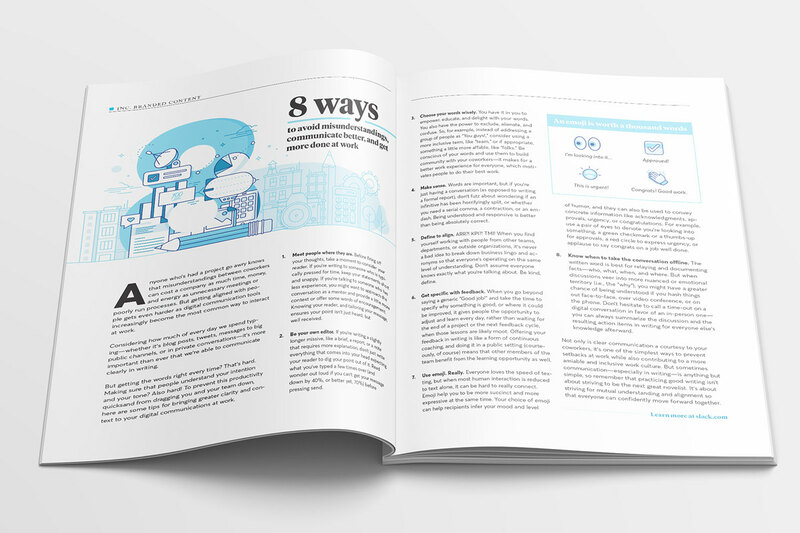 We also published eight print advertorials – each with its own unique editorial illustration in the same campaign style, accompanying a full-page brand ad – on topics relevant to knowledge workers and potential Slack customers. 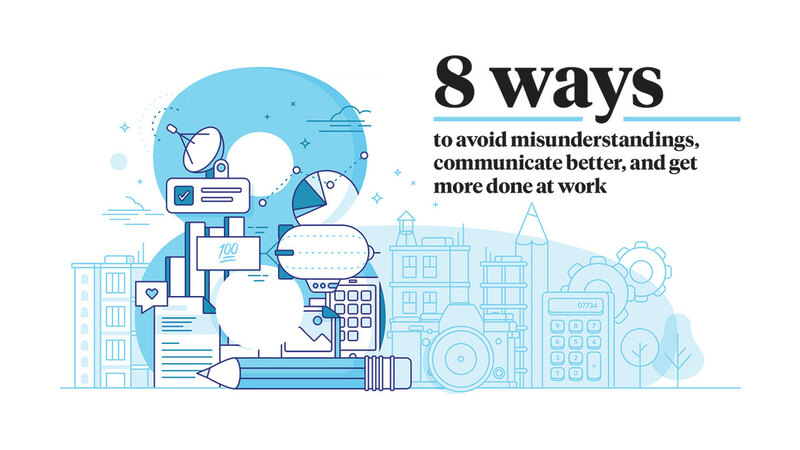 Shown below are the editorial illustrations and layout designs for INC Magazine, FastCompany, WIRED, Delta Sky Magazine, and Nashville Post. 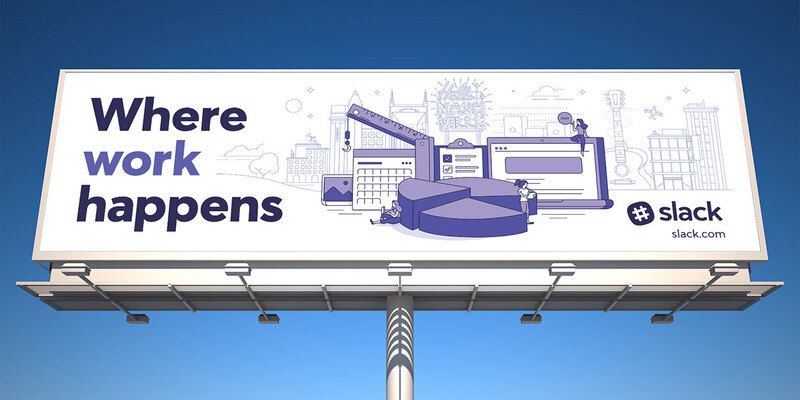 We ran campaign ads specific to each local market across Google and Pandora (in conjunction with audio podcast advertisements) as well as a social media takeover of our Facebook and Twitter accounts featuring the campaign artwork. 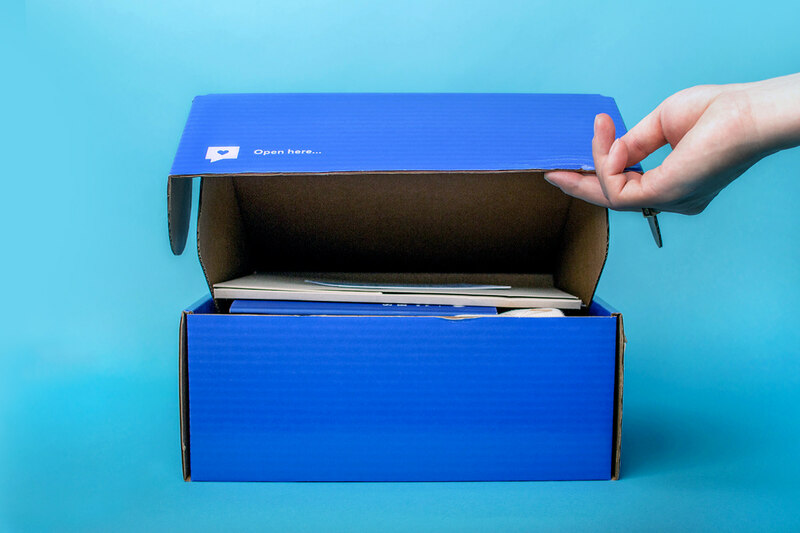 Another tactic that we launched was a series of "love box" mailers to customers and prospective customers in our targeted cities of Nashville, Berlin, and Salt Lake City. 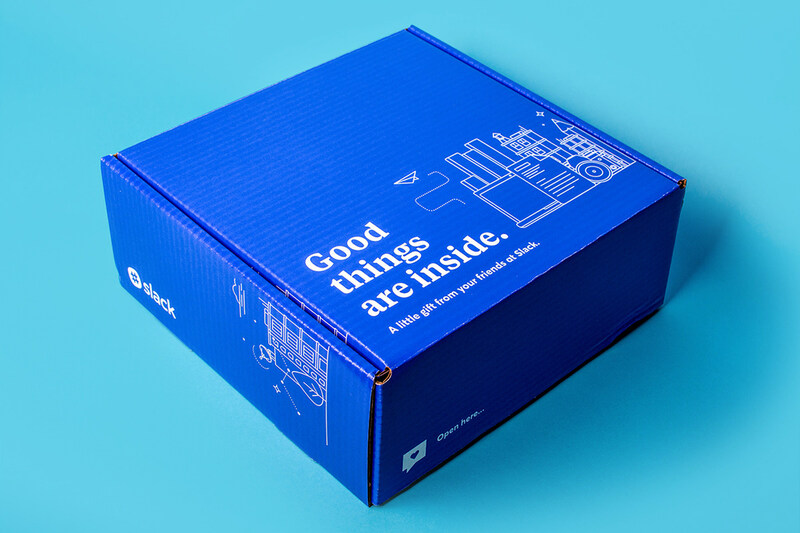 I designed a custom shipping container with campaign illustrations wrapping the exterior of the box. 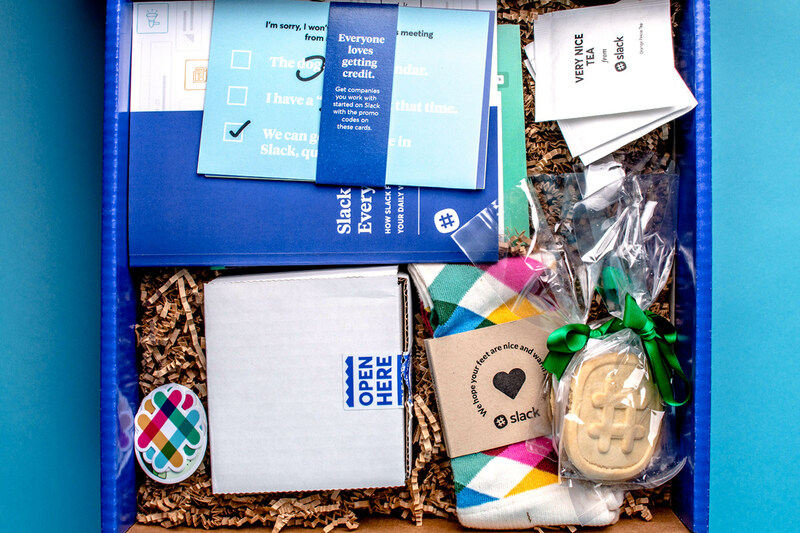 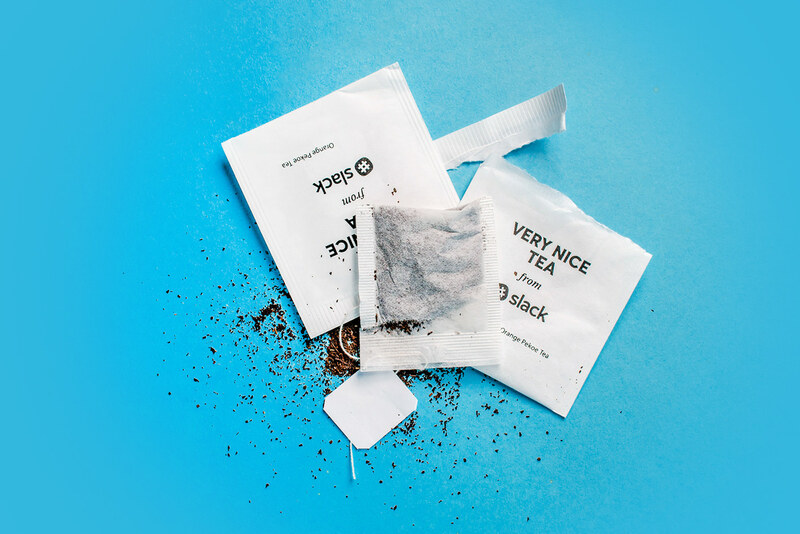 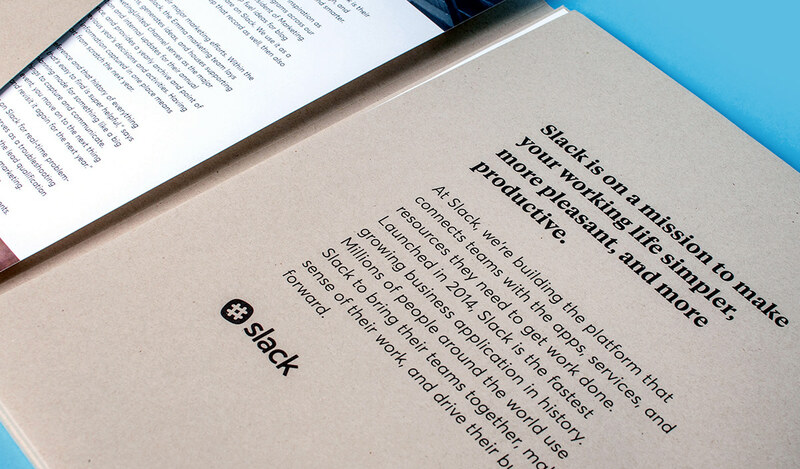 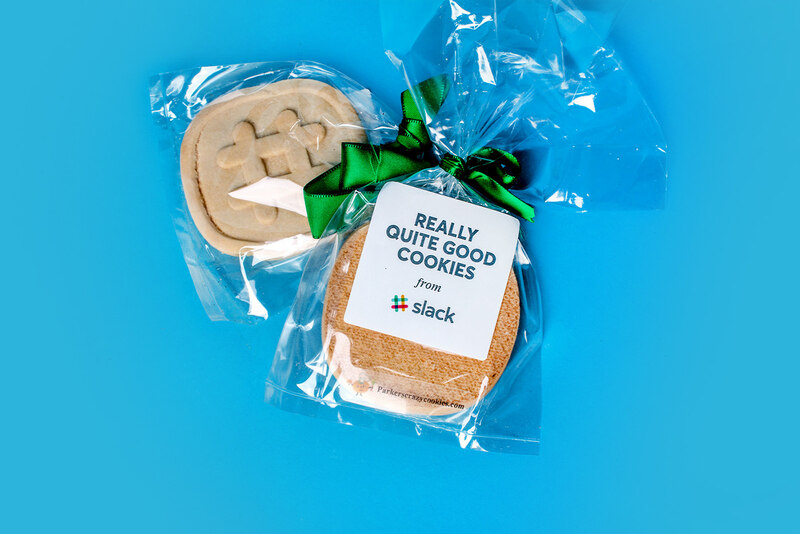 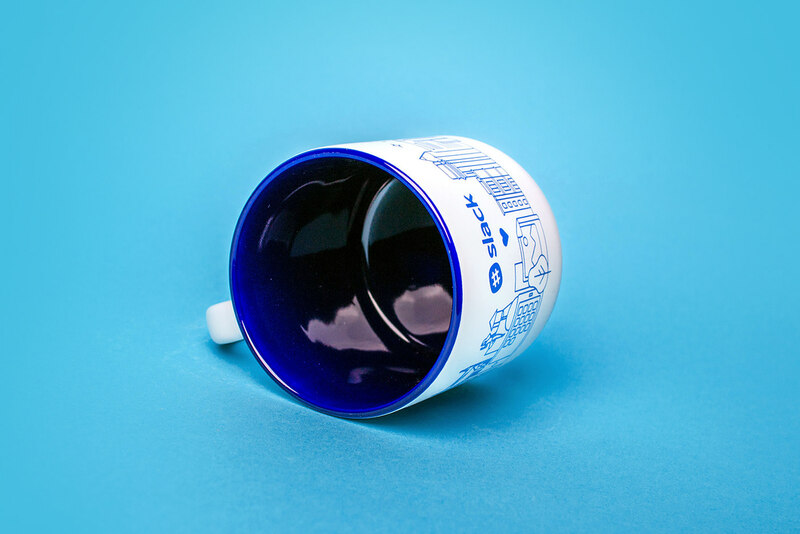 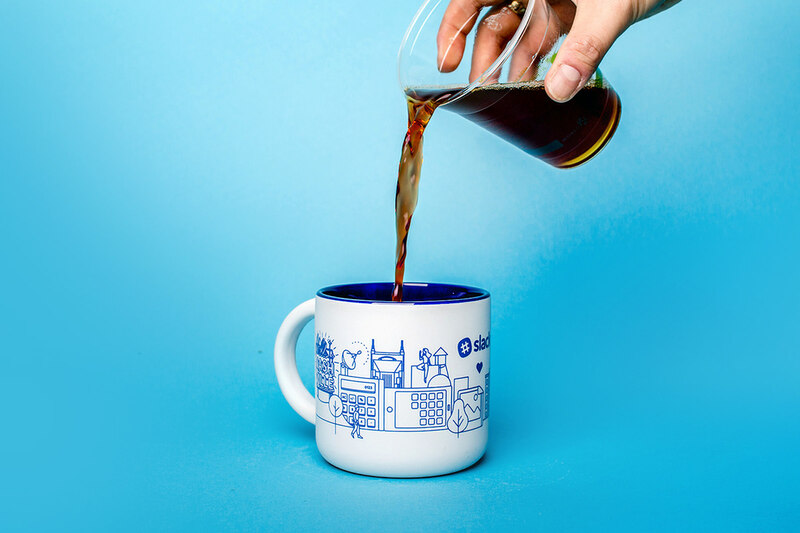 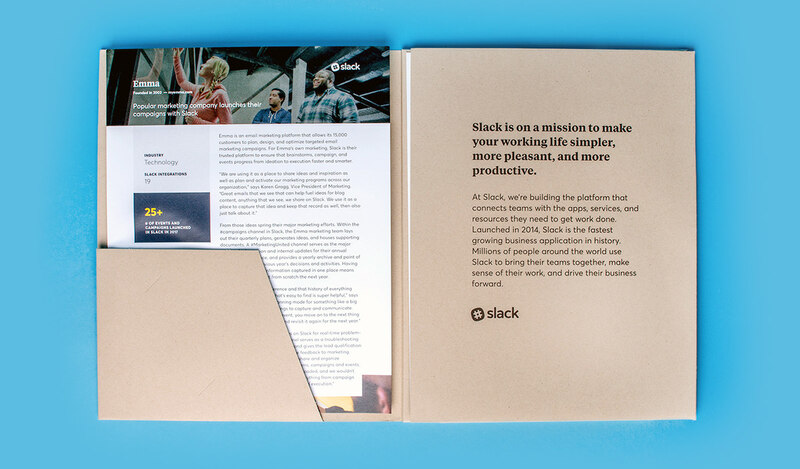 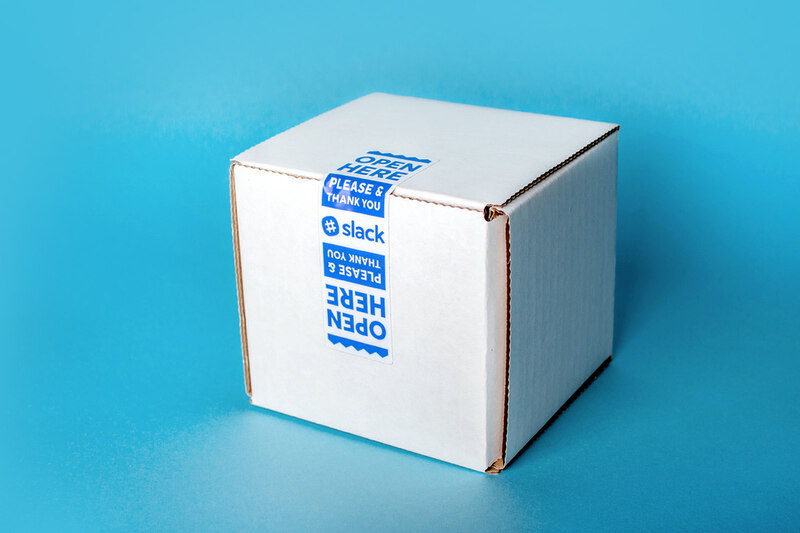 Inside of the box, there was a custom folder containing case studies from other customer companies; stickers, postcards, and a coffee mug with illustrations specific to the recipient's city; a pair of Slack socks, as well as a pack of very nice tea and cookies "from your friends at Slack." 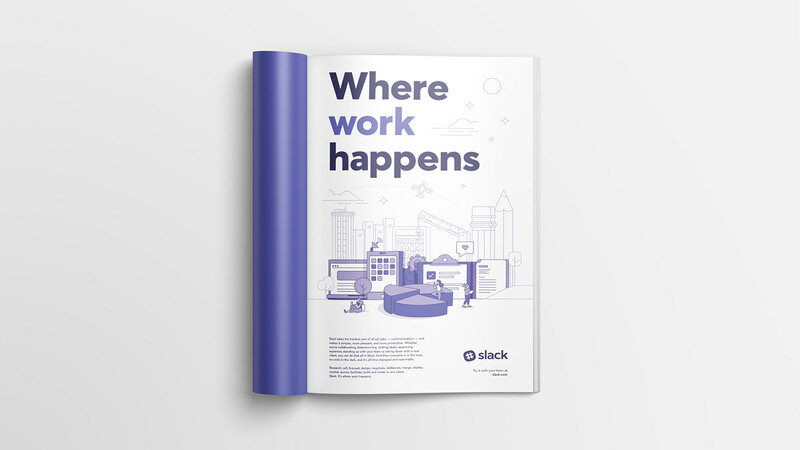 Slack's 2017 national and international advertising campaign “Where Work Happens” illustration and design by brand designer Russell Shaw features artwork specific to the cities of Nashville, Salt Lake City, and Berlin as well as unique to the careers and roles of creative, sales, entrepreneurs, and engineers and software developers. 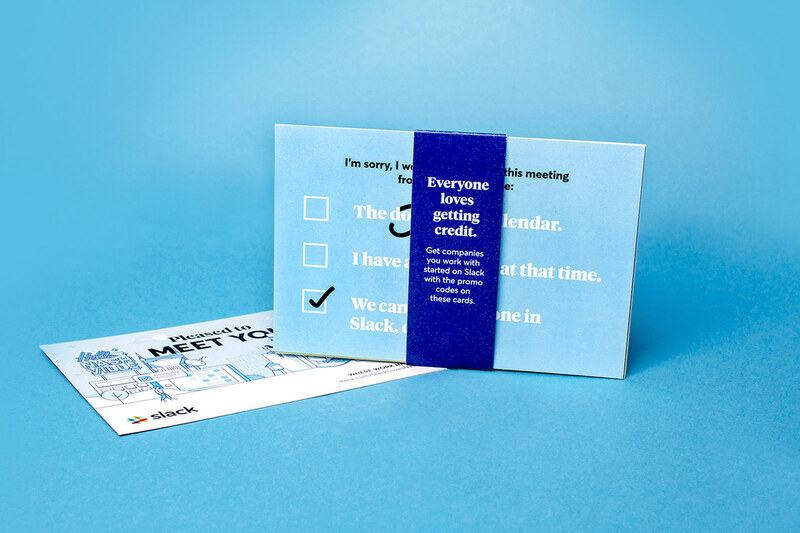 This is a case study of the out of home, print ads, advertorials, digital and direct mail for the integrated marketing communications campaign.